We are delighted that the mainstream media has finally caught wind of something we’ve known for nearly four decades: fresh ground flour is better. Way better. Fresh milled flour has better texture and a more complex depth of flavor. Even the highest quality commercial flours are unable to duplicate it. The difference is obvious as soon as you taste our bread. Great Harvest’s legendary whole wheat bread was made from just five simple ingredients in 1976: water, salt, fresh yeast, fresh ground wheat, and molasses — and it was good enough to build a national franchise on. Today we make it with honey and our Honey Whole Wheat Bread remains one of our best sellers. When most people think of fresh bread, they recall a flavor memory of warm bread, just baked in the oven. In fact, so-called “fresh” baked bread is often made from frozen dough. It may have been processed in bulk at a central distribution center and then sent to various store locations months ago. Even if the dough was recently made, it was most likely made from commercial flour with additives, conditioners, and other manipulation of the wheat’s original form. In other words, what you may think of as “fresh baked bread” is probably not very fresh at all — only recently baked. As with any plant-based whole food, the less processing wheat is subjected to, the more nutrition and flavor it retains. At Great Harvest, when we talk about fresh bread, we mean that our superior wheat kernels were ground into fresh whole grain flour this morning, and we added only simple, recognizable ingredients to compliment the sweet, nutty flavor of the wheat. We made fresh dough from scratch, by hand, and baked it for you. Why is whole grain so good? A whole grain is any grain (not just wheat!) 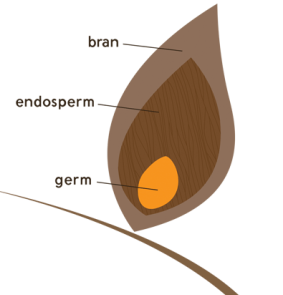 which maintains all three of its parts: the bran, the germ, and the endosperm. Keeping all three parts of the grain means that you keep all of the beneficial components the whole grain has to offer. Our fresh ground whole wheat flour retains all the protein, fiber, vitamins, minerals, antioxidants, and phytochemicals that are naturally found in the whole wheat kernel. We don’t remove anything. There is no additional processing to the fresh flour after it is ground on-site at your local bakery cafe. There are many health benefits associated with whole grain and whole food diets; it follows that consuming whole grains in their freshest, most whole form provides a nutritional advantage. But the greatest appeal of bread made from fresh ground flour is that it tastes better. The freshest, highest-quality ingredients yield the best taste, and that’s what we put into our whole grain wheat bread. We don’t have to add in extra ingredients to compensate for anything lacking in our whole wheat flour because we start with the best and keep it simple. This allows us to keep our ingredient lists short and recognizable.